A coil is moved through a magnetic field as shown in Figure 23.59. The field is uniform inside the rectangle and zero outside. What is the direction of the induced current and what is the direction of the magnetic force on the coil at each position shown? Figure 23.59 A coil is moved into and out of a region of uniform magnetic field. Current is clockwish, force is left. 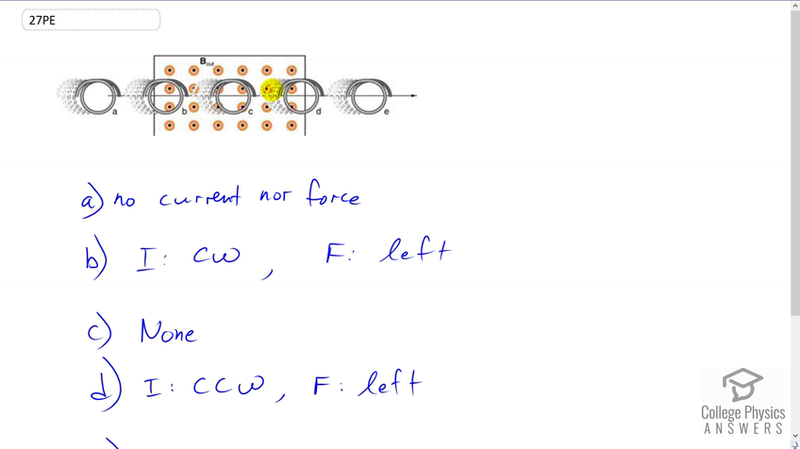 Current is counter clockwise, force is left. This is College Physics Answers with Shaun Dychko. We have a coil that is moved through this region where there is magnetic field lines coming out of the page and then it's past that region to this place where there's no magnetic field. And, as the magnetic flux through the coil changes, there will be an induced current in the coil and also a...there will be a force on that current. And we're going to figure out what the direction of the induced current is, and what direction of the force will be on the coil. So, in part A, there's no magnetic field lines and there's no flux and so there's not going to be any induced current, and therefore no force. In part B, it's going from a region where there was no flux through the coil into this region where there is flux in the coil. And so, the induced current will try to create a magnetic field that opposes this new magnetic field. And so, the induced magnetic field will be pointing down so I'm gonna put xs to show going away from as these are the tailfeathers of an arrow going away, the induced magnetic field will go down in order to block this magnetic field coming towards us. And when you grab this wire with your right hand, and point your fingers down inside the loop, your thumb points in the direction of the current; and that's going to be clockwise. So, the induced current is this way -- clockwise. Then, in this part here, the coil is moving but there's no change in the magnetic flux of the coil. And it's that change that's important. Having the presence of flux is not sufficient to induce anything so you need to have a change in the magnetic flux to induce a current. And there's no such change, it's going from this place where it had lots of flux through it, to here where there's the same flux through it and then to here where there's the same flux again. There's no change and so there's no induced current and no force. Oh, by the way, I should tell you the force on this coil in part B. So, we point our fingers in the direction of current, let's say we consider this point here--or sorry I didn't say that right. Let's point our thumb in the direction of the current. So that thumb is gonna be pointing down. The fingers are going to be pointing out of the page in the direction of magnetic field. And your palm is pushing in the direction of the force that will be applied. And that force will be to the left. So the force is to the left. Okay. Then, part D, we're going to have this coil going from a position of lots of flux to a position here where there's no flux to it. So, it's going to be losing some flux through the coil. And, the induced magnetic field is always seeking to oppose the change, and so it will seek to replace this magnetic field that it once had. And so, the induced magnetic field will be coming out of the page. And so, we will grab this coil with our right hand, and the fingers will curl out of the page, in the middle of the loop. And the thumb will be pointing in the direction of the induced current, which is going to be this way, which is counterclockwise. And then, to figure out the direction of the force, point your thumb in the direction of the current, which is downwards here. And then, point the fingers out of the page, which is straight up. And then again, we will see that the force is to the left. So, thumb downwards, in the direction of the induced current, fingers out of the page, in the direction of the magnetic field, and the palm pushes in the direction of the force to the left. And, this makes sense from a different perspective too because this induced current is always opposing changes. And so, when you're moving the coil into this region, you would expect something opposing that to be trying to get it out of the region. And again, now here, you're taking the loop out of this region of high flux. And so, you would expect the opposition to that be a force that would try to bring the loop back into that region. And so, again, force to the left. So that's more of a intuitive Lenz's law perspective on why the force is to the left. And then, in part E, there is no magnetic flux of any kind. And so there's no change in magnetic flux, and for that reason, there is no induced current and no force.